Bald spots, thinning, and breakage can be symptoms of a serious underlying health condition such as alopecia, lupus, thyroid issues, and other common types of disease that cause hair loss. If you have noticed a dramatic increase in shedding or other change in the appearance of your hair, Drs. Robert J. Dorin and Robert H. True can help. During an evaluation at one of our offices in New York, New Jersey, or Boston, we can discuss your options and provide you with solutions to restore your appearance and confidence. Amongst a growing list of issues and concerns, hair loss can then lead to additional stress and anxiety during times of illness. Lupus: This long-term autoimmune disease causes a myriad of symptoms that may affect your skin, resulting in hair loss. 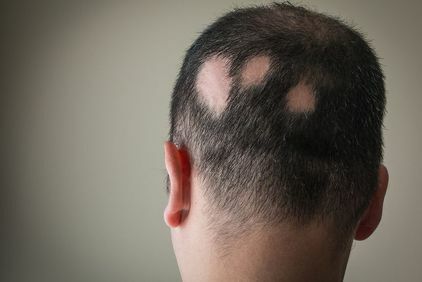 Alopecia Areata: An autoimmune disease that affects the skin and scalp, causing hair to suddenly fall out. Thyroid Problems: An overactive or underactive thyroid can both be contributing factors to hair loss. Cancer: Cancer such as Hodgkin’s lymphoma may cause hair loss but typically, chemotherapy is the primary cause. Eating Disorders: Eating disorders like anorexia and bulimia not only stress the body but also divert important nutrients away from the cells that help grow healthy hair. Burning Scalp Syndrome: Researchers have been unable to identify whether symptoms like itching, burning, and pain lead directly to hair loss, or whether the symptoms and loss are more intricately linked. Polycystic Ovarian Syndrome: This hormonal disorder can cause problems with hair growth, leading to loss and thinning. Trichotillomania: Little is known about the cause of this condition, which leads to an irresistible urge to pull out healthy hairs from the head or other areas, such as the eyebrows. The added stress of losing hair can make a serious diagnosis even more difficult to manage and overcome. At True & Dorin Medial Group, we understand how overwhelming this time can be and the role your hair plays in your overall self-confidence. Fortunately, through our advanced techniques, including FUT (follicular unit transplantation), FUE (follicular unit extraction), and other hair restoration solutions, we can help you regain the fuller, thicker, and healthier head of hair you desire. Whether you are currently noticing thinning hair, or you are recovering from a disease that caused your hair loss, we will design a personalized approach that can help you achieve your goals. To learn more, please send us a message, or contact us at (866) 629-0866.